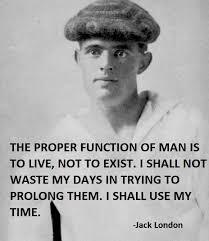 And now, dear reader, back to our brief and breathless look at the life of Jack London, who mowed down every obstacle in his way — illegitimate birth, wacky mother, abandoning bio-dad, just for starters — to become a literary legend. We’ve already covered Jack’s early years and his youth as a factory worker/oyster pirate/sailor/sometime jailbird/budding socialist, after which he went to high school, did a year at UC Berkeley before running out of money and headed to the gold fields of the Klondike. And then wrote The Call of the Wild and lots of other great stuff. We also touched on his first admittedly loveless marriage to “Mother-Girl” Bessie, capable of bearing sturdy children but not, apparently, of holding Jack’s interest much beyond that. Time now to introduce you to Charmian Kittredge, destined to become the second Mrs. London, Jack’s muse and partner in adventure. An accomplished writer, pianist, and equestrienne, as well as a wildly determined feminist, it’s a sad comment on the baked-in sexism of history that Charmian receives so little attention. She’s mostly known for being Jack London’s wife, even though she outlived him by 37 years. Admirably, she didn’t wait around for the world to recognize her role in the great man’s career. 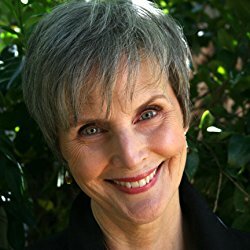 She produced three major autobiographical works about the life they shared: The Log of the Snark, Our Hawaii, and a two-volume tome called The Book of Jack London. Full disclosure: no, I haven’t read them. Yes, I intend to. I’ve got a reading list that reaches to the moon and back. So, Charmian. Born in 1871 (four years before Jack) to a mother who was a poet. Mama died of Valley Fever when Charmian was six years old, and elderly, frail Papa sent his little girl to Oakland to live with her childless aunt and uncle, Ninetta and Roscoe Eames. Aunt Ninetta tutored Charmian in academics, as well as feminism, vegetarianism, and socialism. The first and third “isms” stuck; I’m not sure about the vegetarian thing. on a tour of Europe. She was known around the San Francisco Bay Area for her spectacular piano playing at local concerts, and also for her scandalous habit of riding her horse astride instead of sidesaddle. She supported herself, bought her own horse and paid for its board, and had a part-time maid. She became an accomplished photographer. She remained happily single. All this, at a time when women still wore whalebone corsets. Since Aunt N and Uncle R were the editors of the Overland Monthly, to which Jack was a regular contributor in the 1890’s, Charmian and Jack rubbed elbows now and then. But she was seeing someone else, and there was Mother-Girl waiting at home for Jack. So it was elbow-rubbing only until either the spring of 1900 or the summer of 1904, depending on which source you believe, when Jack and Charmian found themselves alone together and discovered they were madly, passionately in love. Actually, I can’t think why it took Jack so long to figure that one out. Here was a woman who was brilliant, accomplished, courageous and unconventional, whose ardor matched his when it came to things like socialism and horseback riding, and who was moreover a first-rate typist (he was a writer, remember). On top of all that, she was a lifelong proponent of free love. Wikipedia blithely describes her as “a sexually active and adventurous partner,” quite unlike poor, dull, purity-loving Bessie. 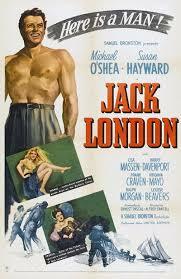 Charmian became Jack’s “Mate-Woman”, and as awkward pet names go, I guess that’s an upgrade. 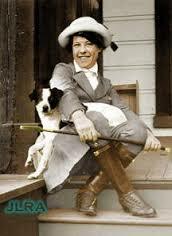 So Bessie got politely kicked to the curb and Jack and Charmian were married in 1905. Together they survived the San Francisco Quake of 1906, and documented its aftermath in articles and photographs. By this time Jack had already found fame and fortune enough to fund his grand schemes, and Charmian was nothing if not game. 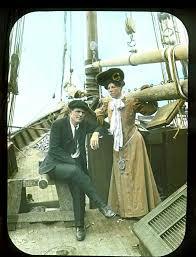 In 1907 they sailed off in the small, elegant, and terribly built Snark, intending to make their way around the globe. They spent a glorious interlude in Hawaii. They visited their friends the Stevensons, as in Robert Louis Stevenson, in Samoa. They made it all the way across the South Pacific before having to abandon the voyage due to their ship’s fatal flaws and the ravages of some strange tropical disease that had assailed Jack. Whatever it was, it would be with him to one degree or another for the remainder of his life. That was a setback, but they weren’t the types to sit around and boo-hoo about what might have been. They embarked on another great adventure, building their dream home. Thus was born Beauty Ranch in idyllic Glen Ellen, just a winding one-hour drive from where I call home. 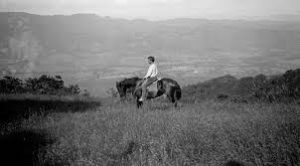 The ranch is now the focal point of Jack London Historic State Park, and it is so very worth a daylong visit that I really must insist that if you haven’t been there, you make plans to do so. Seriously, you should get out your calendar right now. With Jack and Charmian’s combined energy and enthusiasm, Beauty Ranch became a grand experiment in progressive era agricultural practices as well as gracious living. Guests could swim in the manmade lake and ride horses through the redwoods (you can still do the latter, if you make advance reservations at Triple Creek Horse Outfit, right in the park: it’s run by very nice people who treat their horses extremely well. While a ride there isn’t cheap, it’s a wondrous way to experience the park and you also get a chit for free wine tasting at nearby Benziger Family Winery, or at least that was true last summer when I went with a friend. So fun.). All this took a fair amount of income to keep up, and Jack stuck to his 1,000 words per day writing schedule along with all the farming and riding and building and hosting. It’s possible that he turned out a few potboilers during this period just to keep the money rolling in. You can’t write White Fang every day. But there were plenty of gems among the rough, and when you go to the museum housed in the lower floor of Charmian’s “House of Happy Walls” you can see copies of every book he churned out. There were a bunch of ‘em. Charmian never remarried. She lived out her later life in her house on the ranch, with its elegantly unfussy and light-filled rooms decorated with the remarkable objects she collected on her travels in the South Pacific. She wrote, she traveled, she curated Jack’s estate and guarded his memory. When she died in 1955, her ashes were interred next to Jack’s on a knoll at Beauty Ranch, beneath a mossy boulder. Not long after Jack’s death, she entered into a brief, torrid affair with a man she and Jack had been friends with for years. A married man, he was torn about his dalliance but he couldn’t resist the sublime Charmian. He was famous too, although not as a writer. Maybe you’ve heard of him. 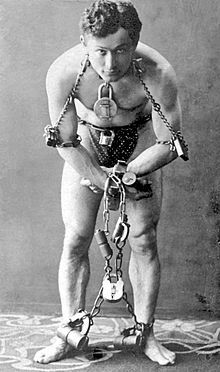 His name was Harry Houdini. What’s your take on all this? Do you think a writer has to live big in order to write big? Who’s your muse?